When I was first married, I used a lot of bottled marinades in my cooking. There are some delicious bottled marinades you can buy, but once I realized how easy it is to make your own marinades, I started saving money. Not to mention that a lot of bottled marinades contain high fructose corn syrup or other chemicals that aren’t as healthy for our bodies. I also discovered that it could be quite fun to experiment with making my own marinades from simple ingredients. The other great thing about marinades is that you can use them with all kinds of meats. Some marinades taste better on certain kinds of meat than others, but most marinates can be used for several types of meat. For example, the marinade in my featured recipe this month, Sanpete Style Pork Chops, works great with turkey, chicken, and pork. Marinades start with a liquid base. Usually part of the liquid base is acidic and the other part is oil. The acid helps tenderize the meat and create more flavors. Popular acidic bases for marinades include wines, soy sauce, citrus juices, vinegar, and even soda pop. The oil in the marinade also tenderizes the meat and it helps the flavors to stick to the meat. Most marinades contain salt and spices. A lot of marinades use freshly chopped herbs, garlic, and onion. When I create a marinade, I like to think about what type of meal I am creating and what we will be eating with the meat. For example, is this an Asian inspired dish? Will this chicken be eaten with pasta or rice? Do I want the meal to be spicy? What type of meat would taste best with fruit salsa? There is a lot to consider and a ton of possibilities! Fish Marinades – I love citrus based marinades for fish. Orange juice, pineapple juice, and lemon juice are my favorites. Spices like dill, lemon pepper, paprika, and thyme work well for fish. Most fish does not need to be marinated for a long time (30min-1 hour is usually sufficient)… if you do marinate it too long, the acid may start to “cook” the fish and make it tough. Mexican Marinades – If you are making tacos, enchiladas, or burritos, you might want to create a flavorful Mexican meat. Mexican marinades use oils, vinegar, and often lime juice. It can also be fun to marinade Mexican meats in salsa or taco sauce. Cumin, chili powder, cayenne pepper, and garlic powder are common is Mexican spice mixes. Asian Marinades – Asian food often has a little more of a sweet flavor to it and many Asian marinades contain some sugar. Soy sauce is a very common liquid base for Asian marinades. Sesame oil, rice vinegar, and oyster sauce are also common. Asian herbs and spices include ginger, garlic, turmeric, green onion, and lemongrass. 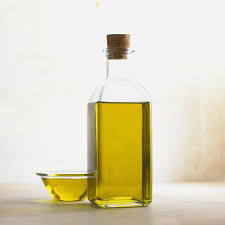 Italian Marinades - Cooking wines and olive oil are the staples of Italian marinades. Grape juices can sometimes be substituted for wines. Italians also love garlic, as well as basil, oregano, and parsley. 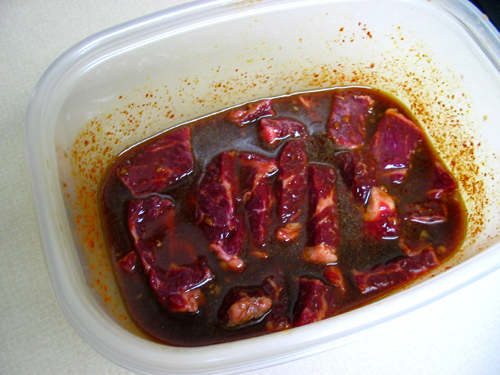 All-American Marinades – Americans love to barbeque, and barbeque sauce is a common marinade. A little extra spice can add some kick to your barbeque or mixing some honey into your sauce can satisfy your sweet tooth. I recently came across a recipe for root-beer pulled pork sandwiches… why not try marinating meat in some root-beer? It doesn’t get more American than that! 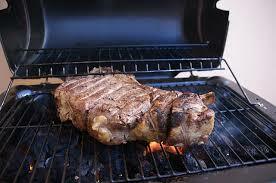 Here is a recipe for a steak marinade I created a couple of years ago. Have fun creating marinades! Feel free to share some of your recipes in the comments below. Combine all ingredients except steaks in a large ziplock bag. Seal bag and shake to mix. Add steaks. Seal bag again and coat steaks. Marinade in the refrigerator at least 30 min... longer is better!